The ASEAN faces old and new challenges, and a huge long-term opportunity. The next three decades could witness the shift of global economic momentum from the Trans-Atlantic axis to the Trans-Asian axis. Recently, the Association of Southeast Asian Nations (ASEAN) marked its 50th anniversary in Manila with President Duterte hosting the celebrations. Despite its importance, the Summit’s international coverage remains unacceptably marginal. But times are changing. Today, ASEAN’s combined population amounts to 640 million, which makes it the world’s third-largest market. The combined ASEAN economies total $2.6 trillion. The grouping is a major regional power. What matters even more is how important ASEAN and Asia could become globally in the next three decades. “The biggest challenge for the ASEAN moving forward will be for it to stay united,” said Singapore's Ambassador-at-Large Tommy Koh in a recent interview. I first met him a few years ago in Singapore, while serving in the EU-Center. Then, too, he expressed similar concerns – for a reason. As major powers compete more intensely with one another for influence in Southeast Asia, ASEAN will come under competing pressures. Until recently, Washington still saw the grouping as an extension of its postwar hubs-and-spoke security system, while Brussels perceived the ASEAN as its weak replica, a sort of EU lite. In the EU, integration was often seen as a norm for other groupings; in the US, regime changes have often been justified in the name of US view of “freedom.” North Korea is a textbook case (and one that could, under some circumstances, result in tragic devastation). In the recent Summit, Washington sought to pressure ASEAN to downgrade diplomatic exchanges with North Korea. But it is neither the ASEAN way nor its experience to isolate another country and condemn them. They know that imposing sanctions simply will not work. Instead of isolation, condemnation and imposed sanctions that won’t work, violations of international consensus should result in elevated cooperation, integration and positive rewards, which do work. That’s the ASEAN way, which offers great lessons not just in Southeast Asia. In the past, Koh would patiently explain to the EU officials the ASEAN way, and its basic principles; cooperation, amity, and non-interference. To Brussels, that meant integration without integration. To ASEAN, integration is not conceivable without sovereignty. That’s the lesson of colonial subjection. When the ASEAN was created in 1967, Southeast Asia was still overshadowed by America’s might - and miscalculations. Washington hoped to use ASEAN as a front against communism in Vietnam and insurgencies within the region, including Philippine efforts to defuse the former Hubalahap militants through amnesty, Suharto’s anti-communist “New Order” in Indonesia, the Malaya fights against communists and so on. Yet, it was not just the perceived external enemy that led to the creation of ASEAN. It was fueled by the thirst of economic development. After centuries of colonialism and the decision by Washington and Moscow to export Cold War and its conventional wars to Asia, living standards had fallen far behind the Western averages in Southeast Asia. Even in Singapore, the wealthiest ASEAN economy, per capita incomes were barely 15% of those in the US; in the rest of Southeast Asia and China just 1-5% of the US level. Assuming continued peace and stability, US per capita incomes could rise to $70,200 by 2022. But in Southeast Asia, the catch-up will be even faster. In Singapore, per capita income, based on purchasing power parity, will exceed the US level by a whopping 50%. In Indonesia and the Philippines, the corresponding figures could be 24% and 17%, respectively; in China, about a third of the US level. In the West, secular stagnation will ensure subdued growth rates; in Southeast Asia, continued catch-up is likely to keep them relatively high, due to solid output potential. By 2022, at the end of the Duterte era, the Philippines will be the second-largest ASEAN economy, right after Indonesia. The collective economic power of the ASEAN is likely to climb to $4.1 trillion in the next half a decade, right after the US, China, and Japan. A decade later, the economic size of China will surpass the US, while India and the ASEAN have potential to leave behind Germany and – over time - Japan. Let’s try to see even further. By 2050, Indonesia’s population could climb to 327 million, and the Philippines would be the world’s 10th most populous nation with some 155 million inhabitants. In the ASEAN, 820 million people would represent the world’s third-largest grouping. Indonesia would be the world’s fourth largest economy, followed by the Philippines (23rd), Vietnam (24th), Malaysia (28th), and Thailand (29th). With their combined economies, these ASEAN-5 economies alone would put the region ahead of Japan, Brazil, Germany, Mexico and UK. Unlike the EU’s deep integration or shallow approach of the North American Free Trade Agreement (NAFTA), the ASEAN represents a balancing act between national sovereignty and economic size. In the past, it was the transatlantic axis - that is, economic cooperation between the US and the four core EU economies of the UK, Germany, France and Italy - that drove global economic prospects. 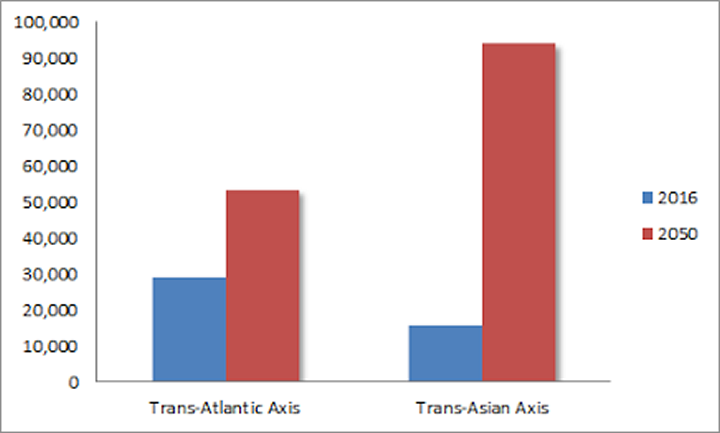 By 2050, it will be the trans-Asian axis; that is, economic cooperation between China, India, and the ASEAN-5 that will fuel global economy, politics and security (see Figure). By then, the transatlantic economy of the US and the EU-4 could amount to $70 trillion, but the trans-Asian economy of China, India and ASEAN-5 would represent $95 trillion, which could grow by another $10 trillion with East Asia – Japan and South Korea. But none of these achievements will happen automatically. They require unity. In order to deliver the future, the ASEAN must not only cope with pressing short-term and medium-term challenges, it must also remain focused on the long-term perspective.